The EL7332 EtherCAT Terminal enables direct operation of two DC motors. It is galvanically isolated from the E-bus. The speed is preset by a 16 bit value from the automation unit. The output stage is protected against overload and short-circuit. 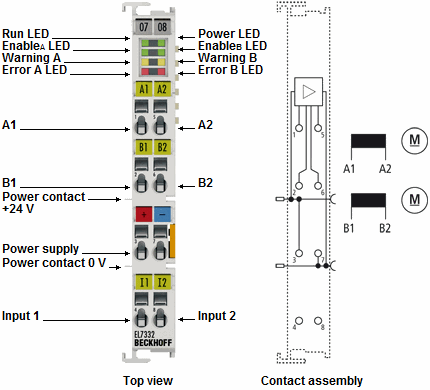 The EtherCAT Terminal has two channels that indicate their signal state via light emitting diodes. The LEDs enable quick local diagnosis.